Kinch, man of destiny, sets out on a new career. ...cheerio, as I go, on my way. I got the final call at 13.23 yesterday. At that time I was informed that I had been successful in my application to join An Garda Siochana* and that I had been accepted as a recruit. It's been a long road with a long way still to go, but I look forward to the next two years with a new buoyancy and optimism. There are going to be challenges, separation from Mrs. Kinch, living with my in laws at weekends, study, poor pay (just for the first year), long hours of shift work and all those other problems associated with the profession of being a guardian of the public peace. But there will also be many compensations, a job with meaning and purpose, a camaraderie that I've long envied and a pay and benefits package that make me feel confident that I will be able to fulfill my responsibilities as a husband and (hopefully in the not too distant future) as a father. I'm feeling something of a kinship with the Duke of York and Albany at present. My big development may or may not be in the immediate future. It's currently stuck in the sort of limbo that would, when I was in the Army Reserve, result in us spending a great deal of time getting on and off trucks or sitting in trucks with nothing to do beyond singing "The Grand Old Duke of York" or the company song "Yogi Bear." I should know by Monday for definate, but I'm packing in the expectation of going. Mrs. Kinch is bearing all of this with amazing good grace and a calm that is usually associated with women who are rolling bandages and loading muskets in Residencies surrounded by the angry Pathan. I've been told that a single bookcase will have to do me for a year and I'm spending my spare hours, packing and assembling the few books that will be sustaining me for the year. At present there is a great deal of Napoleonic history, a selection of books relating to my gaming projects, some books on the Risorgimento, the complete Annotated Sherlock Holmes, the complete Brigadier Gerard, a smattering of C.S. Lewis, a complete set of Allan Mallinson and Patrick O'Brian and a little poetry. I'm taking the opportunity to ditch those books that have just become an encumberance, but in a strange way the experience is liberating. I know that I will get my other books back, but picking a years worth of reading in one go is very interesting, much like deciding on travelling companions for a long journey. An artist's impression of the Kinch household over the last few days. His charity is only exceeded by his draughtmanship. The Kinch household is all ahoo at present and there is a great deal of packing, sorting, putting away and boxing up taking place. There are some big changes coming, I can't quite own up to what they are just yet, but hopefully that will alter. It looks like Mrs. Kinch and I will have to move house shortly, with Mrs. Kinch moving home while I will be living an itinerant existance for a year or so. We've been planning for this for over two years, but it's all come to fruition with astonishing suddenness. Now while all this means that there will be major real life changes coming, the more proper subject for this blog is what those changes will mean for my wargaming. Firstly, a great deal of my stuff will have to be packed away and scattered around the various family homes, so that I will be unable to get at it for a while. Secondly, I won't be free during the evening to ramble down to the pub and partake of Thursday evening wargaming. The Halberdiers will continue as it is mainly a weekend and internet based thing, but my involvement in other forms of gaming will be sadly limited. I reckon my gaming will take three forms over the next year. The Halberdiers & a sometimes game of Call of Cthulhu. I bought the carrying bag for this game a few months ago and packing gave me the opportunity to try it out. For a bag designed to carry two copies of Memoir '44 and copies of the Terrain Pack, the Eastern Front and the Pacific Theatre, it actually holds two copies of Memoir '44, two of all the above supplements, extra map boards and the Mediterranean supplement, as well as the Air Pack and Hedgerow Hell. I thought I was mad to spend that thirty odd quid on a bag, even one that came with a new map and scenario, but Richard Borg has always justified my faith in him and it emerges yet again he was right. For those of you not in the know Memoir 44 is a light Second World War boardgame that plays in about an hour. Commissioned to commemorate the 60th anniversary of the Normandy Landings, it has been a great success and now has supplements that allow you to refight battles in the Mediterranean, Pacific and Eastern theatres. Two copies of the game allow you to play a six to eight player variant with chain of command rules that have greatly enriched our wargaming over the last few years. Playing the new breakthrough variant with Fitz over the last few days has rekindled my interest in the game; as it's slim and portable I think this will be forming a large part of my wargaming for the next year. My new years resolution in terms of figure painting is paint more cavalry. I've been casting my eye over the new Tabletop Teasers book and I lack the squadrons required for most of the Teasers, unless of course, I play them with my 2mm Napoleonics. ...maybe just for the bigger games. One of the advantages of spending weekends at my inlaws will that I will sometimes have access to an honest to goodness table, something I can genuinely play games on, rather than the small coffee table or the floor option that do duty at present. 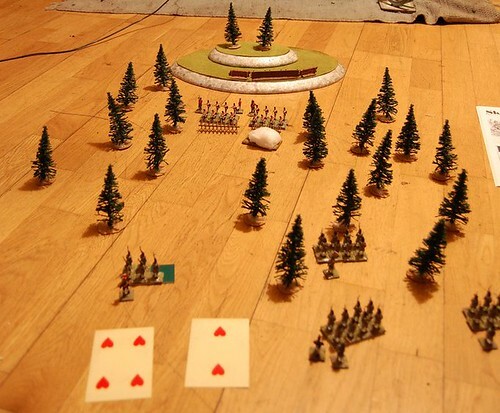 I could probably get some of the smaller teasers off the ground with 20mm figures if I use small units, eight troopers to a cavalry squadron and sixteen men to a battalion of infantry. My medium term, six month, goal is to paint enough small squadrons to play a few Teasers and finish at least one full cavalry regiment for both my British and my French forces. My long term, twelve month, goal is to paint sufficient figures to field two small forces for Charge! These will be individually based, so they will also be useful for the Halberdiers and for other games. I have a fair start made at these, but think I shall make more progress for having a plan. A Small Army of All Arms for Charge. One mounted General Officer and two mounted Aide de Camp. Two regiments of Foot each consisting of. Two Pack or Bat Horses. Brother Against Brother & The gun that fired the shot that launched a hobby. Can you get any more old school than playing on the floor? I've learned several things in the last few days. Brother against Brother is a very pleasant man to man black powder skirmish game that hares along at a very acceptable rate and will probably (with some tweaking*) form a part of the Kinch arsenal for some time to come, handling as it does horse, foot and guns without recourse to sums. Mrs. Kinch and I spent some quality time together as we'd not seen much of each other over the Christmas, including some very profitable moments spent doing damn all of use. In the words of that great philosopher-hobo Mr. David Lister of Deep Space Mining Craft Red Dwarf. "Even vultures need time to put their feet up and read "What Carcass?" Magazine." With that advice for the ages ringing in our ears, Mrs. Kinch and I settled down to an evening spent watching Poirot mysteries, wargaming (Myself) and crotchet (Mrs. Kinch). Pictured above you will see the fruits of the solo Brother Against Brother game played that evening. Four sections of Frenchers versus two of Redcoats, the result was a French victory (boo!) despite their having been hammered by lucky early volleys. Two sections marched up the Redcoat's position and engaged them in a desultory long range fire, while their compatriots flanked the position to attack with the arme blanche. 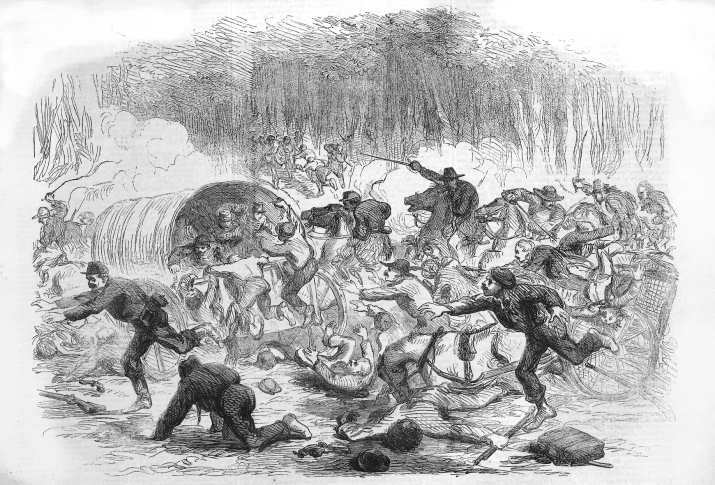 The British attempted to disengage after decimating the French covering party, only to be engaged by the flanking party in a close fought close combat, that resulted in both sides fleeing the field. The second British section fired and knocked a few of the foe on the head, only to be charged again by a French section that had not bothered to reload. The resulting kerfuffle left the French masters of the field. All in all, including set up, consulting the rules and such, this little engagement took about an hour. The refreshments did not include tea (sorry Steve), but took in a very palatable Chateauneuf du Pape and an amiable Grahams Tawny. Sadly, I did not finish the Tawny in one sitting, for which I shall have to port fine myself come the next Halberdier's game. Which go to show that drinking and gaming are pass times that go very well together, though not so photography. My father would beat me if he saw the lamentable state of the shots above and he'd be right to do so. * Brother Against Brother is a fast and pleasant game. The morale system shines. * Firepower seems a little overpowering, even though I was using smoothbores most volleys told and told hard. I may be missing a trick here. * Melee is a dicey business for all concerned, which is as it should be. * Setting your camera up on a tripod and setting it to take pics at five minute intervals is a truly awful way to document a game. * Sections may not move if they do not have a company officer within six inches of their section leader. This means that these officers spend great deal of time running about chivying sections hither and thither. * Company officers may move on any friendly sections card. * The penalty for "Rested Weapons" in the rulebook is typo. * There is also no bonus of reserving your first volley or account taken of gunsmoke. While this would introduce an element of record keeping, I think they would benefit the game. Further play will determine if such additions are warranted. 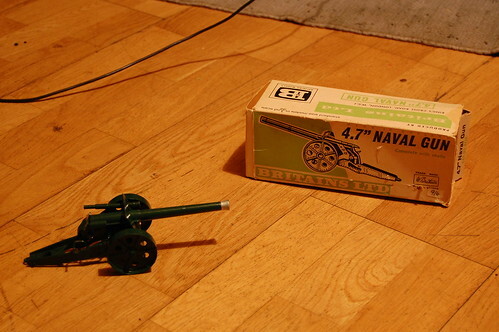 The Rolls Royce of miniature cannon, the Britain's 4.7 inch naval gun. I was also given just after New Years this magnificent piece of work as a Chrismas gift by a friend of mine. A very thoughtful and wholly undeserved gift that works as well today as it did when it was made. Actually handling one of these made a great many points made by Wells in "Little Wars" much clearer. The firepower of the guns is not as overpowering in the rules as written, because the range is not as great as I thought it was and the projectiles provided are smaller than I imagined. *It is the mark of the war-gamer that no shop bought set of rules is ever...quite right. I have sworn to play at least another five games of Brother Against Brother before doing anything to the ruleset. Too often I find, gamers alter some aspect of a game before they play it and end up complaining of things that the game designer was aware of and had accounted for in play-testing, his simple and elegant fix to the problem having been crushed beneath of the chariot wheels of indiscriminate tinkering.